Nyjah Huston's Pro Slix by Ricta Wheels. Ricta Slix: Grind Faster - Grind Longer. 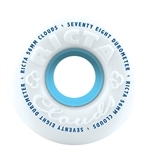 The revolution in skateboard wheel technology continues... Ricta Slix combine our NRG Formula, proven THE fastest urethane in skateboarding, with a custom molded TPU slide insert for three times more slip and minimal drag on the inside of the wheel for longer and faster grinds. Bearings and spacers sold separately included.